Imagine plowing your field and running over a 1,600 square foot ancient Roman mosaic. Sounds impossible, but that's exactly what happened in southern Turkey. In 2002, Nick Rauh, a classics professor from Purdue University was walking through a recently plowed field. He noticed that the plow dug up a piece of mosaic tile. He tried getting the local history museum to help excavate the site, but they did not have the funds. So the site was left alone. Then in 2011, the museum received the needed funds and they decided to uncover the hidden gem. They employed the biggest and baddest team of archeologists to rock out with their shovels out. Michael Hoff, a Lincoln art historian from the University of Nebraska, was the director of the excavation....wait did we say "Lincoln art historian"? We didn't even know that field existed, but that's cool :). The mosaic turned out to be an enormous bath complex built by the Romans. It featured a 25 ft long marble outdoor pool. The Romans knew how to party! This is the largest mosaic ever discovered in southern Turkey. 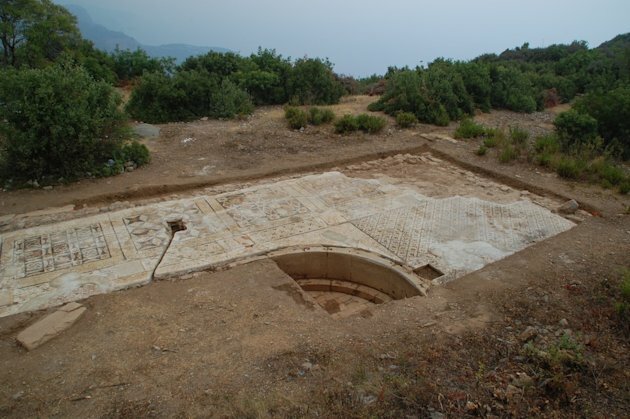 This particular area of southern Turkey is near the ancient city of Antiochia ad Cragum. This mosaic proves that the Romans had a much larger influence in this area than was once believed. The excavation will continue in 2013 and then will be open to the public! Marius Schneider, a 12 year old in Germany, is now on a steady path to recovery thanks to his loving parents. Marius was suffering from cystic fibrosis, a genetic disease which causes thick mucus to build up in the lungs. His family was desperately waiting on a lung donor, but time was running out. Marius was breathing through a ventilator in order to survive. Even though times seemed rough, Schneider was in luck. He has parents that were willing to do anything to get him healthy and they had the help of Germany's top transplant surgeon, Professor Dr Axel Haverich. Marius' father, Lars, stated, "We were desperately waiting for an organ, waiting for a call every day". When a donor could not be found, Marius' parents decided that they would each donate one of their lungs to save their child. Dr Gregor Warnecke, the doctor in charge of Marius' care said "The transplant was his last chance. The hospital would not have operated on his parents if it had not been an absolute necessity". The surgeons at Hannover Medical University operated on all three of them at the same time and the procedure was successful. "Marius was already somewhere between heaven and earth when we operated", Professor Dr Axel Haverich stated. "He was living in a state of almost perpetual anesthesia. But he is a real fighter. We had a team of 40 and he came through." Marius was released from the hospital after 155 days and he can now lead a healthier life without breathing assistance thanks to his loving parents! "There used to be 84 countries in the Olympic Games, now there are 204. Performance levels have become so much higher that it is so hard now to get a medal. I thought, it's time this increase in the competitiveness and the standards was taken account of." And with that, David Mitchell from Derbyshire, England decided that the Olympics needed fourth place medals. And he was the guy who was going to make it happen. So Mitchell went to a local trophy store and spent his own money to have some custom hardware made for the most disappointed of all Olympians. On one side would be the athlete's name and event and on the other, "In Recognition of your 4th Place Olympic Games 2012." The first recipients? British divers Peter Waterfield and Tom Daley. Well now, thanks to Mitchell, Daley and his partner will have something to show for their performance, which though disappointing, left them as the fourth best synchronized divers in the world. And after all, being the fourth best anything in the world is something worth celebrating. But before you cry homerism, Mitchell's not limiting his operation to athletes from the UK. He's said he plans to send medals to select fourth place finishers from around the world. His only worry? "I hope they don't find it insulting, because it's meant seriously and supportively." Moore, Jack. "British Man Sends 4th Place Medals To Athletes Who Came Close" Buzzfeed. 21 August 2012. Web.